This is a portrait of a cat - and an especially beautiful cat at that... His name is Shael Hayit Snowfox. I want any portrait to reflect both the cat and the Purrson the cat owns. 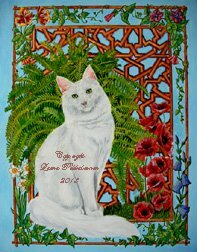 The key to this painting was the fact that Snowi loves to sit in a garden, next to the ferns. So I painted ferns. And Brigitte loves poppies - and poppies popped up on the right hand side corner. The frame developed out of a picture of a Victorian picture frame. And the background was a Moroccon window grille. Again this portrait of a cat is made with great care - I use miniature brushes to bring out the tiniest details. Here is Brigitte' story of Snowi - in German on the left, and in English on the right (the translation is mine, so I do apologize for any mistakes). Snowi wurde am 25.02.2009 geboren und ich habe ihn das erste Mal im Internet auf der Homepage von Anja Fabis gesehen. Mit richtigem Namen heißt er Shael Hayit Snowfox. Für mich stand es ziemlich schnell fest, dass er bei mir einzieht, Anja freute sich auch für mich.
Nach langer Wartezeit war es dann Ende Juni so weit, Snowi kam zu uns. Mein Mann und mein Sohn haben ihn abgeholt, ich konnte leider nicht mit, da es ein heißer schwüler Tag war und mein Kreislauf nicht in Ordnung war. Als mein Mann dann mit Snowi in der Transportbox in unserem Wohnzimmer stand war ich total glücklich. Snowi spazierte aus der Box und kam sofort auf mich zugelaufen, so als wenn wir uns schon ewig kennen würden. Von dieser Stunde an wich er nicht mehr von meiner Seite, egal was ich tat oder wohin ich ging, Snowi war und ist immer an meiner Seite oder in meiner Nähe. Sobald er mich erblickt fängt er an zu schnurren. Am allerliebsten liegt er irgendwo und beobachtet mich mit seinen unergründlich grünen Augen, in die man versinken kann und die einem bis in die Seele schauen. Auch haben wir zwei unsere eigene „Gurr-Sprache“, die ich sonst mit noch keiner meiner Katzen vorher hatte und die nur wir verstehen. Schnell gab es eigene Rituale zwischen uns z. B. bestimmte Spiele, die nur wir zwei spielten oder das Weckritual; zuerst ein wenig gurren und dann an der Bettdecke ziehen und wenn ich dann noch nicht aufstehe, dann wird mein Nachttischen abgeräumt. Snowi macht das alles immer ganz als Gentleman und das ist er auch, ein wahrer Gentleman, nie aufdringlich sondern immer ruhig und vornehm. Mit Snowi fühle ich mich nie alleine und er bringt mich auch wenn es mir nicht gut geht zum Lachen, weil der dann anfängt Faxen zu machen. Ganz liebevoll kümmert er sich auch immer wenn ein Kitten in unsere Familie kommt, er übernimmt dann Erziehungsarbeit der Kleinen; putzt sie, zeigt ihnen alles und bringst ihnen bei wie man sich in unserer Katzengruppe verhält. Also Snowi ist rund um ein super Freund den ich nicht mehr missen will. Deshalb finde ich es ganz toll das Leena meinen Snowi malt und ich ihm damit danke sagen kann für alles was er für mich ist… bester Freund, Tröster und noch viel mehr…eben Seelenverwandte. Snowi was born on 25th of February 2009, and I saw him for the first time on the internet homepage of Anja Fabi. Snowi's official name is Shael Hayit Snowfox. When I first saw Snowi he was six weeks old and I fell in love immediately. I visited Anja's homepage again and again, and felt like Snowi was looking directly at me, as if he wanted to say "I absolutely want to come to you." The decision was quickly made that Snowi would come to me, and Anja was also happy for my decision. And after a long wait, at the end of June, Snowi came to us. My husband and my son went to get him. Unfortunately I was not able to join them as it was a hot, damp day and I had problems with my blood circulation. When my husband stood there in our living room with Snowi in his carrier box, I was totally happy. Snowi walked out of his box and immediately ran to me, like we had always known each other. And ever since then he hasn't moved from my side, no matter what I do or where I go, Snowi is near me. As soon as he looks at me, he begins to purr. What Snowi loves the most is to lie somewhere, observing what I do , with his myserious green eyes. You can forget yourself into those eyes, and it is like they see your very soul. Snowi and I also have our own "cooing-language", something I never had with any of my cats, and something only we two understand. Soon certain ritual developed between us; for example games only the two of us played. Or the waking-up-ritual; first small chirps, and then pulling of the bed covers. If I don't get up, my nightstand will be cleaned of things. Snowi does all this as a Gentleman, and that he really is, a true Gentleman, never intrusive but always acting calm and aristocratic. We also have a going-to-bed ritual. He bites me ever so gently in the finger to let me know "Mommy, it is time to go to bed." I never feel alone with Snowi. Even when I am not feeling good, he makes me laugh with his antics. He also takes loving care of kittens that arrive in our family. He takes over in caring for the little ones; he cleans them, shows them the important things a kitten should know, and teaches them how to behave with the other cats. So you can say Snowi is a super friend I can't be without. I would also like to say it is wonderful Leena painted my Snowi, and with this painting I can thank him for all he is to me… My best friend, my comfort and so much more… My real Soulmate. Below is a detail of this portrait of a cat. To give you an idea of the size of this painting: each whisker is shorter than a match. This portrait of a cat is copyrighted, do not copy. 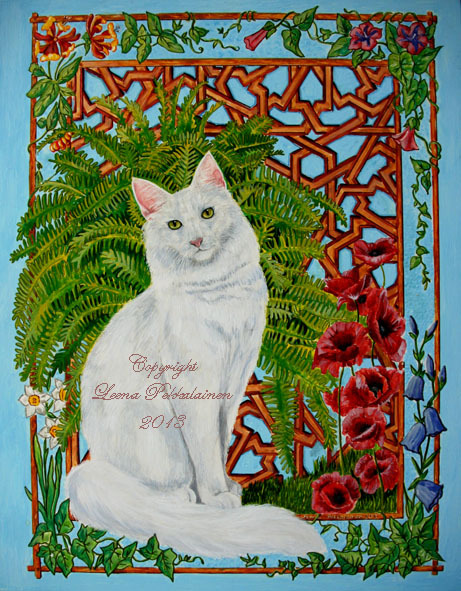 If you like this portrait of a cat, click on the shop links on the upper right hand side of the page and you can purchase the design in printable products. What are American Bobtail cats like as pets? What does an American Bobtail look like? 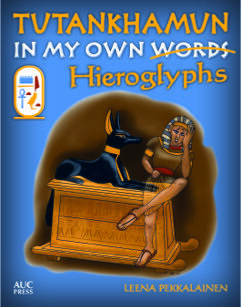 On my other website www.ancientagypt101.com he continues his stories about life in ancient Egypt. 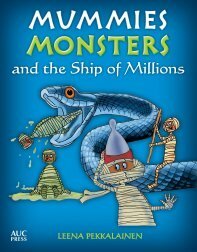 Another hilarious adventure for children with Mr Mummific, the mummy with attitude. He now tells the story of his mishaps, misunderstandings and misadventures as he leaves his tomb through the False Door to embark on the complicated and hazardous journey to the Afterlife aboard the magnificent Ship of Millions. 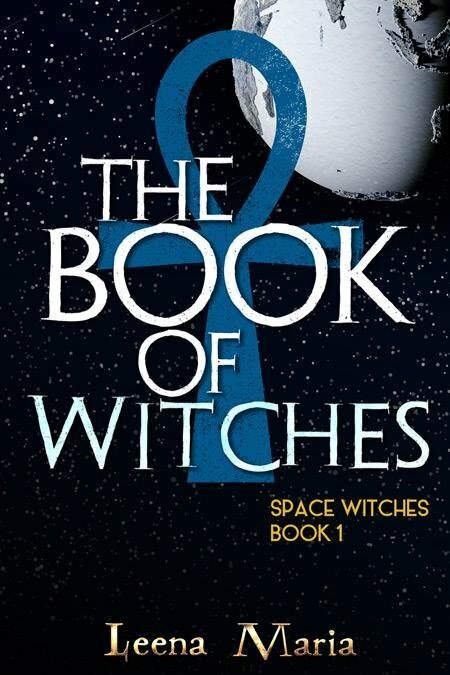 The first book in an epic fantasy series based on human mythology. 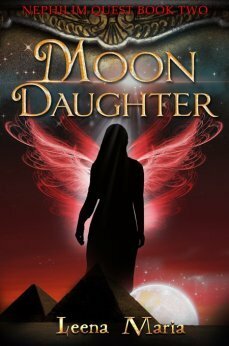 The search for the mythical Watchers, the angels who fathered the Nephilim, the half-angels. 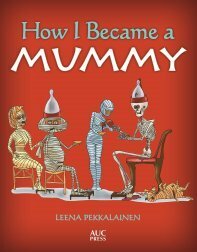 A story that moves on three levels - our times, ancient Greece and ancient Egypt. Perfect. Just perfect. Waking up dead one morning to find you have been evicted from your body by a cursed soul from ancient Egypt. As a result, Nina finds herself in the afterlife, in the Halfway House of those souls who had kicked the bucket prematurely. 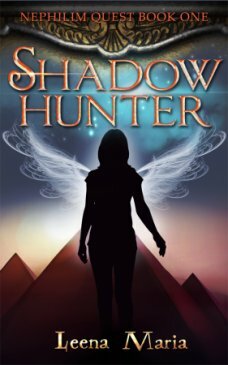 She needs the help of two bored dead teenagers, an ancient angel and a repenting demon, to get back to the land of the living. 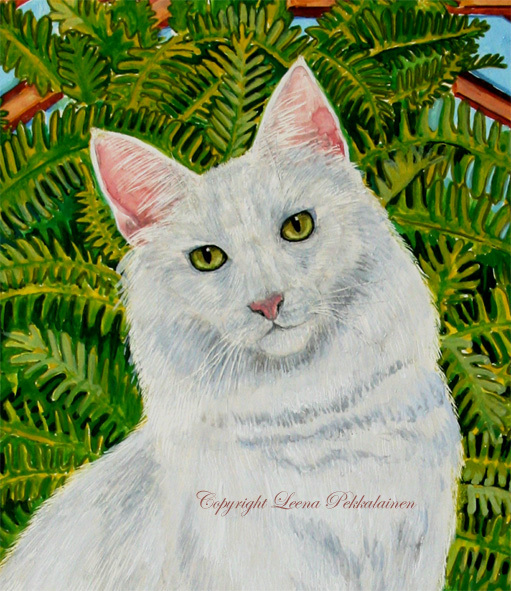 If you like "Snowi's Garden", you are welcome to visit my Zazzle or Cafepress shops, where this painting is available for prints on products. I received the sad news that Brigitte had passed away after a short and severe illness in January 2015. Snowi is taken good care of by her family. I am sure Brigitte is still with us in spirit, now happy and free of pain. It was a privilege to know you, Brigitte. You shall be missed, my friend. 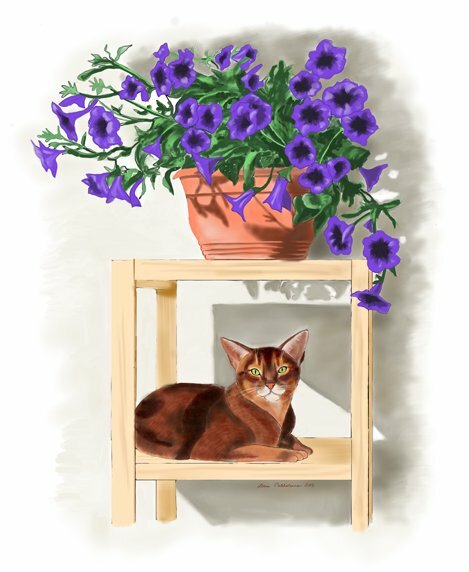 It shows you step by step how to color this pretty Abyssinian cat with flowers. Each page has a color sample, and all the techniques are explained. The information presented here is not intended to replace the advice of your veterinarian or cat breeder. This site is supported through affiliate marketing. A small commission is earned from purchases which funds site research and upkeep. 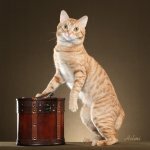 Copyright Cat-Breeds-Info.com 2011-2018 Photographs are copyrighted by their photographers. No reproduction permitted without a written permission. The information presented here is not intended to replace the advice of your veterinarian or cat breeder. This site is supported through affiliate marketing. A small commission is earned from purchases which funds site research and upkeep.